Service-oriented architecture (SOA) promotes the ability to communicate with external enterprises. But what are the issues in creating these Extended Enterprise communications? 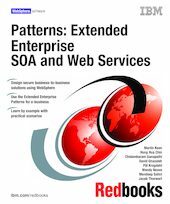 This IBM IBM Redbooks publication addresses these issues for Web services implementations of SOA, using the Patterns for e-business. The Patterns for e-business are a group of proven, reusable assets that can be used to increase the speed of developing and deploying e-business applications. This book focuses on building Extended Enterprise SOA solutions using WebSphere Application Server V6, WebSphere Partner Gateway V6, the Web services gateway component of WebSphere Application Server Network Deployment V6, and WebSphere Business Integration Server Foundation V5.1. Part 1 introduces the Patterns for e-business, and describes the patterns and product mappings within this framework for building Extended Enterprise solutions. Part 2 describes the business scenario used throughout this book, and describes the technologies for implementing an SOA solution. Part 3 provides a set of Extended Enterprise scenarios that include simple as well as more complex SOA solutions that use an Enterprise Service Bus.